OTSU, SHIGA PREF. 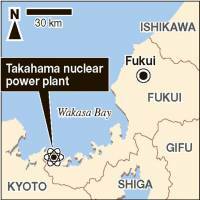 - In a surprise ruling that is likely to delay efforts to restart nuclear power generation nationwide, the Otsu District Court on Wednesday issued a provisional injunction ordering Kansai Electric Power Co. to shut down its No. 3 and No. 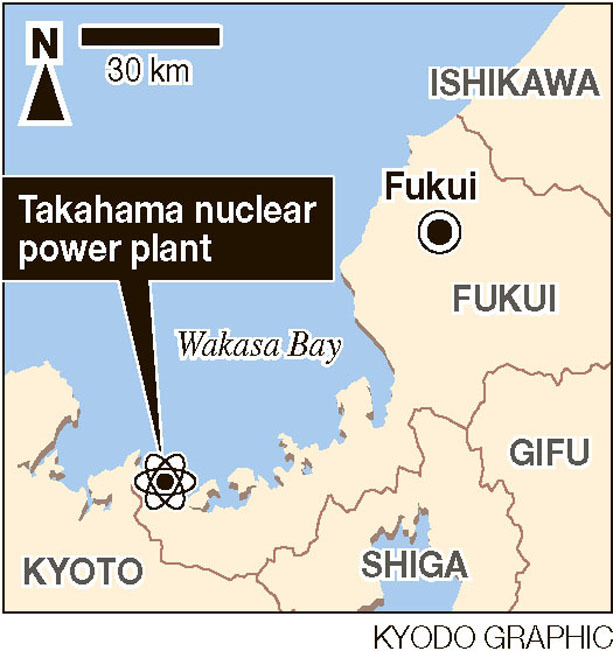 4 reactors at its Takahama facility in Fukui Prefecture. While Kepco is expected to appeal the ruling, company officials said at a news conference that was hastily called after the decision that they would begin operations to shut down the No. 3 reactor on Thursday morning, and expected to complete the process by the evening. The No. 3 reactor was restarted in January, and the No. 4, which had been scheduled to restart last month, was delayed due to technical problems. “There are doubts remaining about both the tsunami response and the evacuation plan,” the ruling said. The Otsu ruling comes just two days before the fifth anniversary of the Great East Japan Earthquake and the resulting tsunami and triple meltdown at Tokyo Electric Power Co.’s Fukushima No. 1 plant. The jubilant plaintiffs expressed surprise and relief following the ruling, which emphasized technical problems regarding the two reactors, including issues concerning an outside power supply source in the event of an emergency. The ruling also raised concerns over the emergency protocol. “This is a huge victory for the safety of children, people with disabilities, and the society and economy of not only the Fukui-Kansai region of Japan but the entire country,” said Aileen Mioko Smith of Kyoto-based Green Action, an anti-nuclear group. Smith was not a plaintiff in the case. The lawsuit that sought the injunction was filed by Shiga residents who are fearful that an accident at the Takahama plant, which lies less than 30 kilometers from the northern part of Shiga Prefecture, would impact Lake Biwa, the nation’s largest freshwater body and the source of water for about 14 million people in the Kansai region, including Kyoto and Osaka. The judgment — the first of its kind affecting reactors that were fired up under strengthened safety regulations following the March 2011 disaster — is a blow to the government’s renewed push for atomic power. The ruling could also cast doubt on the stringency of the new safety regulations. 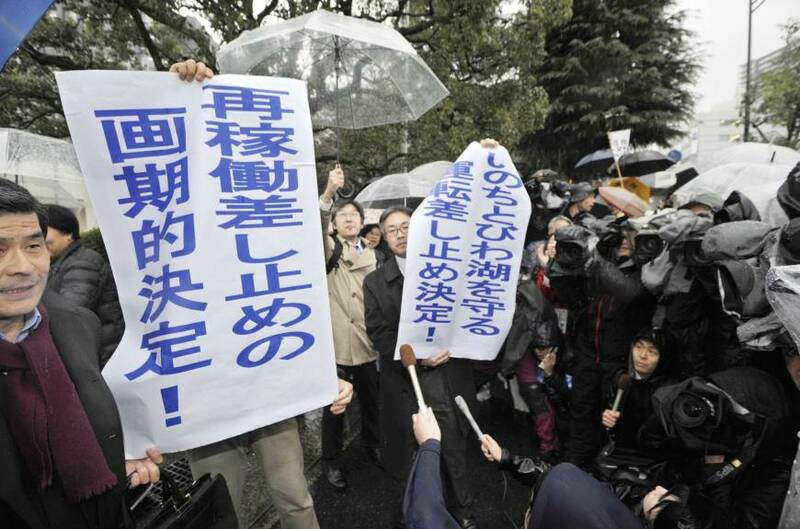 Chief Cabinet Secretary Yoshihide Suga, however, told reporters following the ruling the government would not change its basic stance of promoting restarts. In a separate case concerning the two reactors, the Fukui District Court issued an injunction last April banning Kansai Electric from restarting the units, citing safety concerns. But the same court later lifted the injunction in December, allowing the utility to resume operations at both reactors. 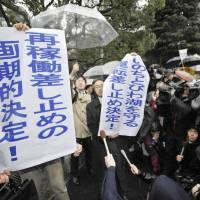 Plaintiffs appealed the court decision to the Kanazawa branch of the Nagoya High Court, where the case is pending. Under the revamped safety regulations, which took effect in 2013, utilities are for the first time obliged to put in place specific countermeasures in the event of severe accidents such as reactor core meltdowns and huge tsunami — which was the initial cause of the crisis at the Fukushima nuclear plant.